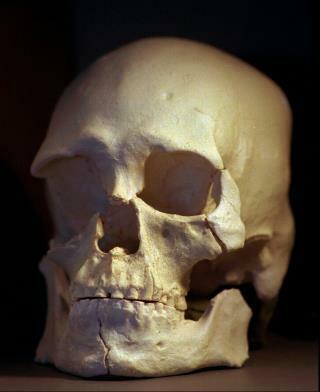 (Newser) – The ancient bones of the Kennewick Man have been returned to the ground. More than 200 members of five Columbia Plateau tribes and bands gathered at an undisclosed location over the weekend to lay the remains of the man they call "the Ancient One" to rest, according to an announcement Sunday by the Confederated Tribes of the Umatilla Indian Reservation, the Tri-City Herald reports. "We always knew the Ancient One to be Indian," says Aaron Ashley, Umatilla board member and chairman of the Cultural Resources Committee. "We have oral stories that tell of our history on this land, and we knew, at the moment of his discovery, that he was our relation." Good thing there was no money for our new government in allowing KM to be buried. Otherwise he'd be sprayed gold and sold at Sotheby's next auction. So this guy has been reincarnated more than once or twice. After I die, they can do whatever they want with my body. I'll be long gone.